Turn to broil for an additional 2-3 minutes, or until the top becomes brown and bubbly. Roughly chop the fresh basil and sprinkle over top! Microwave the squash ahead of time significantly reduces the time to make this, but if you want to roast the squash in the oven, that’s fine. You’ll probably need to roast it for 20-30 minutes, and then continue on with the rest of the steps. The nutritional information (below) is for part skim cheeses. Do NOT use fat free or it won’t taste nearly as good. You can use full fat cheese if you like, but the nutritional stats will be a bit higher. To reduce the watery-ness of the squash, you can press it in a mesh strainer after removing from the squash shell. It won’t get rid of all the moisture, but it can help. If you let the dish sit for a few minutes after it comes out of the oven, it’ll be slightly easier to dish up. Believe it or not, 1/4 of this whole pan is less than 300 calories and 18g of protein! I KNOW. 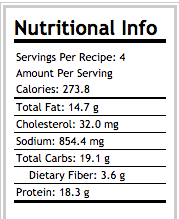 Just out of curiosity, do you find it useful to have the nutritional facts posted for recipes?